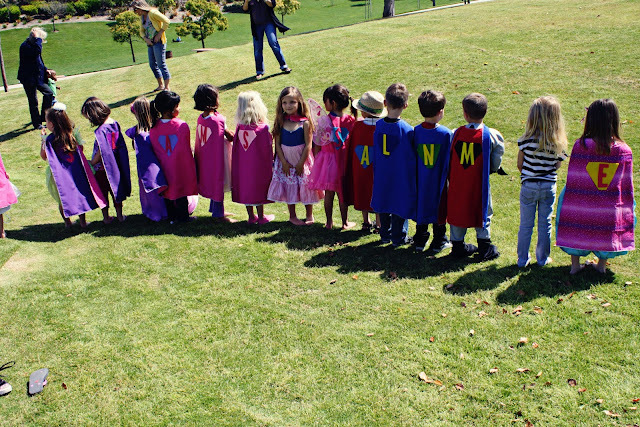 For Emily’s 5th birthday party, I needed to come up with a fun idea for girls AND boys. 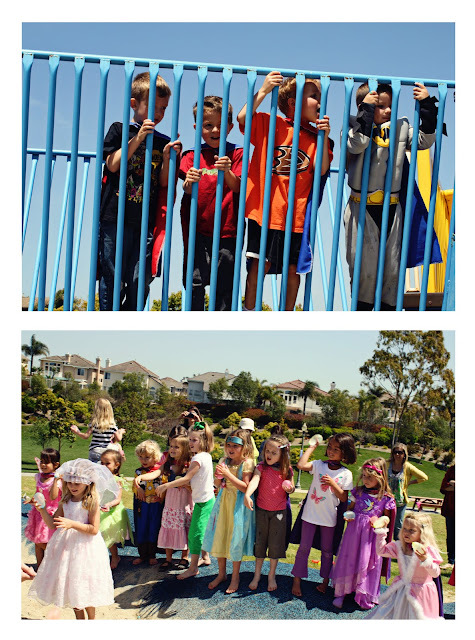 where the kids could dress up like their favorite character. When the kids arrived, I had capes* ready for them, as well as Superman shaped triangles cut out of felt, and their initial also cut out of felt. 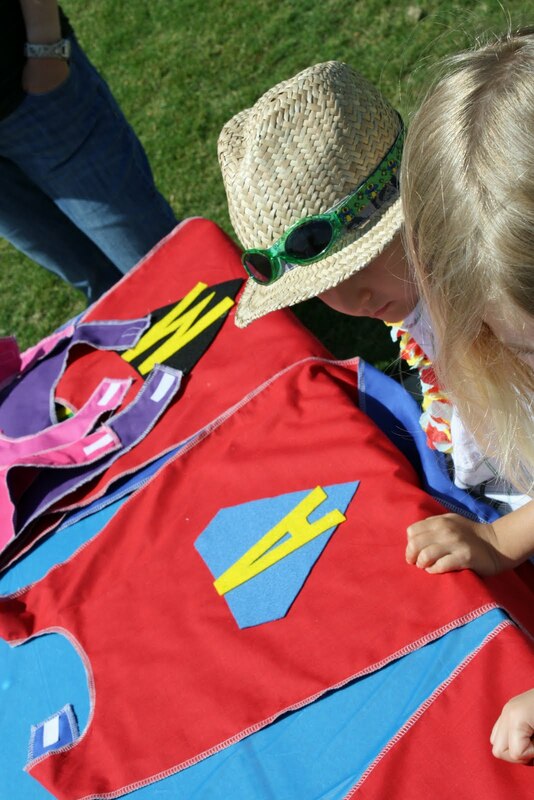 Using fabric glue, I had them glue the triangle, with the initial on top, onto the cape. 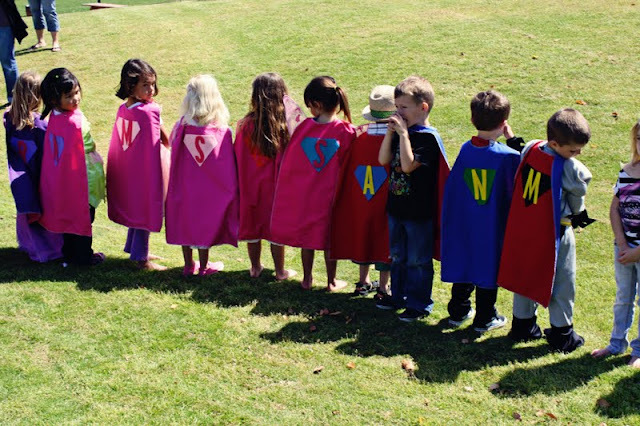 *For each cape, I had cut out two cape shapes in contrasting fabrics, red/blue for the boys, and purple/pink for the girls. I serged around all the edges, and sewed on a strip of velcro for the closure. 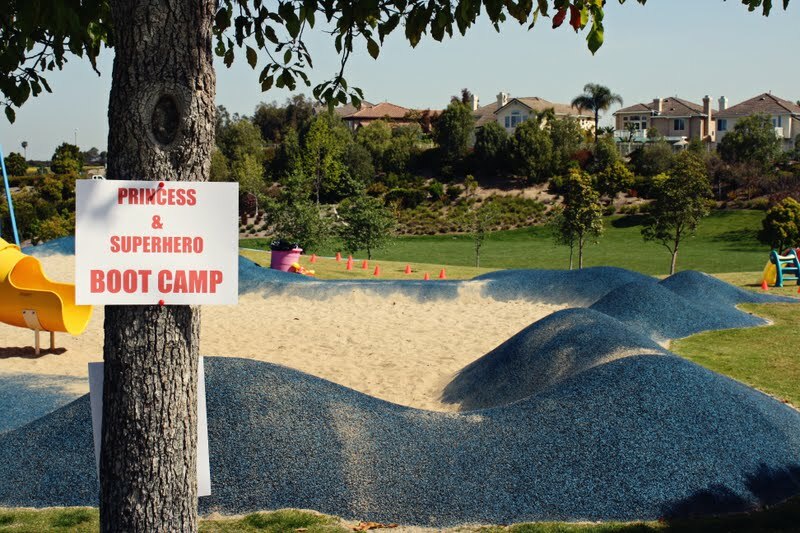 While the capes were drying, the kids went through Superhero and Princess Boot Camp. 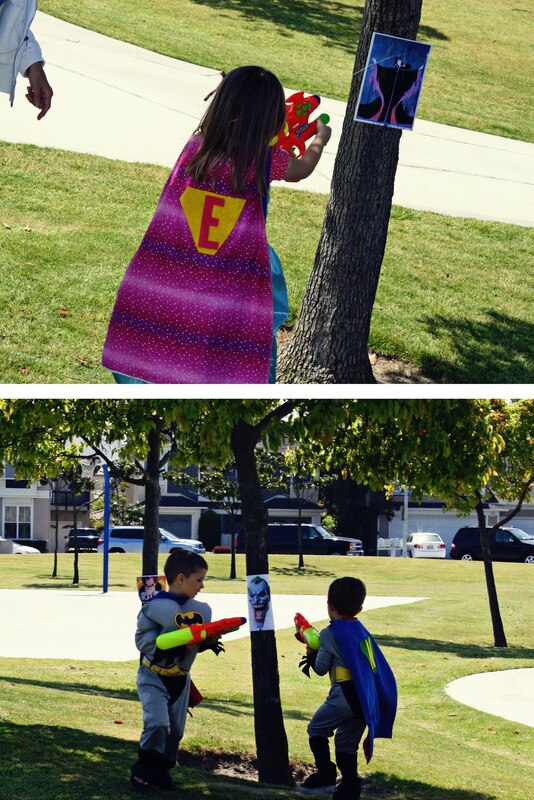 The park was perfect for this. 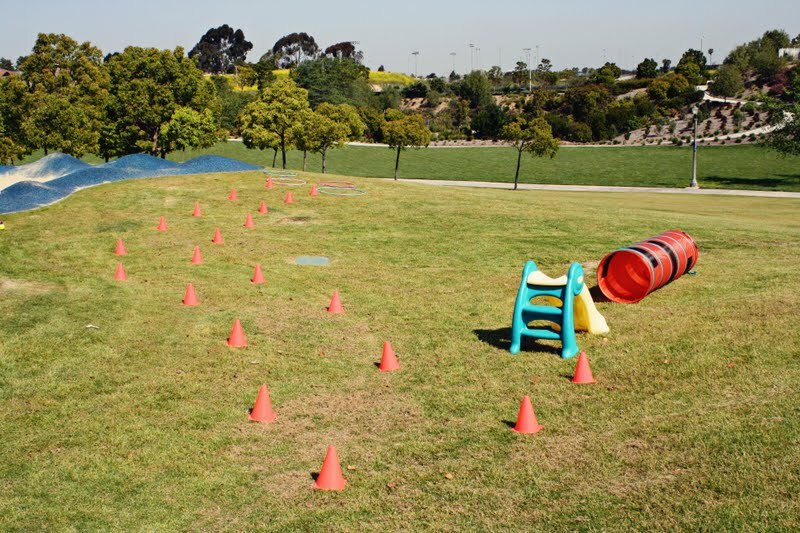 It had spongy hills that bordered the play equipment, so we used these as part of the obstacle course. The rest of it consisted of hula hoops to jump through, cones to run around, a little slide, and a tunnel. 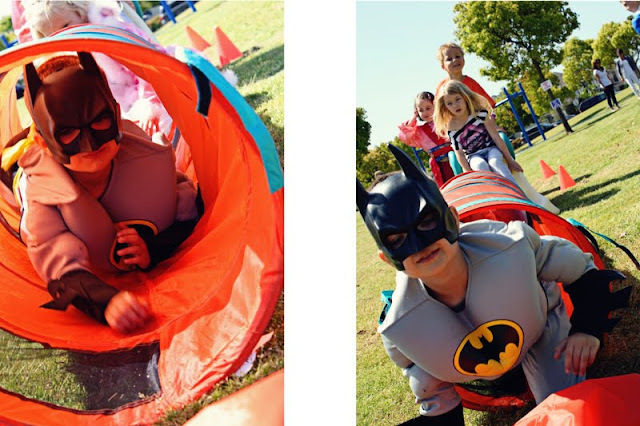 Once each child came out of the tunnel, they were an “official” superhero and got to put their cape on! As an official superhero, their first task was to line up and get a chance to supersoak various villains. 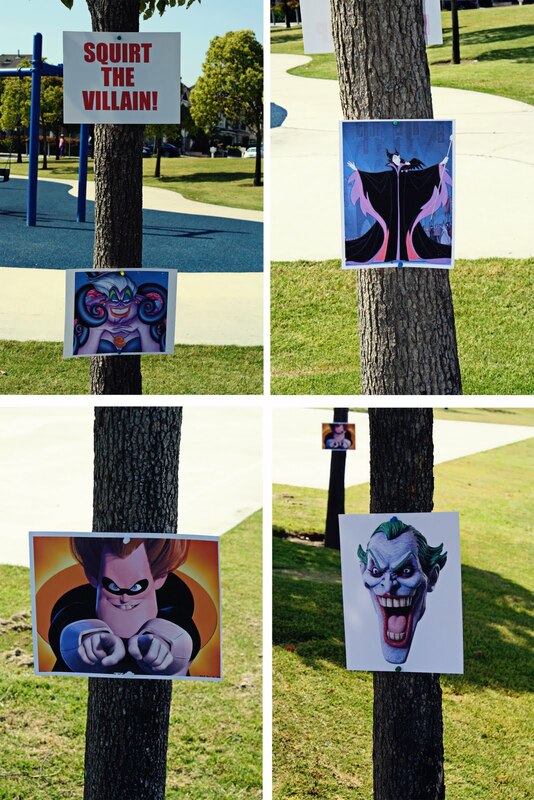 These “villains” were just print-outs which I tacked to trees. They had so much fun! 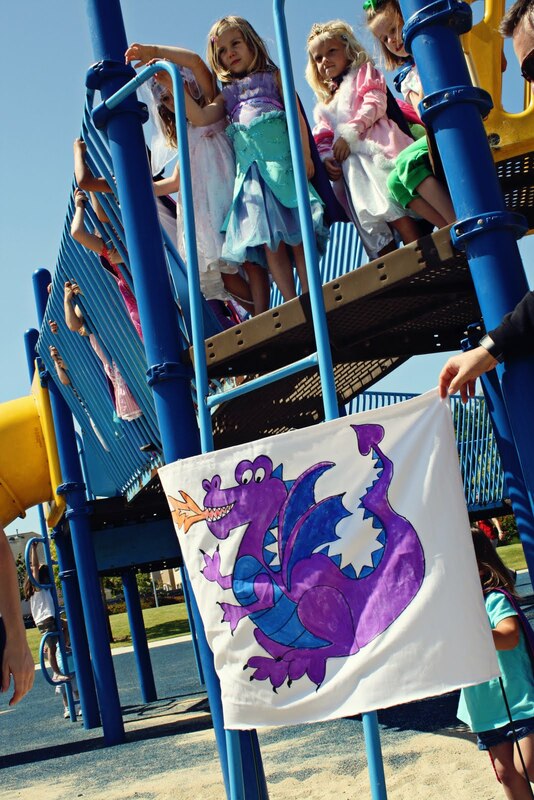 With Autie’s artistic help (she drew me a dragon) I created a dragon banner on a piece of white fabric. 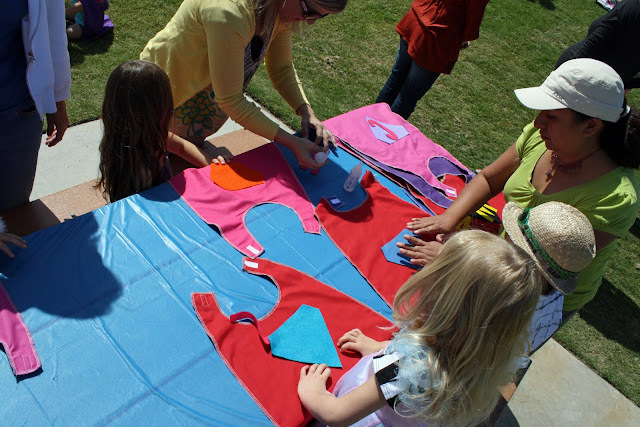 I blew up her picture at Kinkos to poster size, and then traced it onto the fabric. I painted it with my daughter’s acrylic paint. We put the dragon banner at the bottom of the jungle gym, with the girls (and then boys) at the top, “stuck.” Our superheros that weren’t “stuck” on the jungle gym had to save their friends from the fire-breathing dragon using water balloons (We made a HUGE bucket full the night before). When the dragon had been hit enough, the friends could come down. 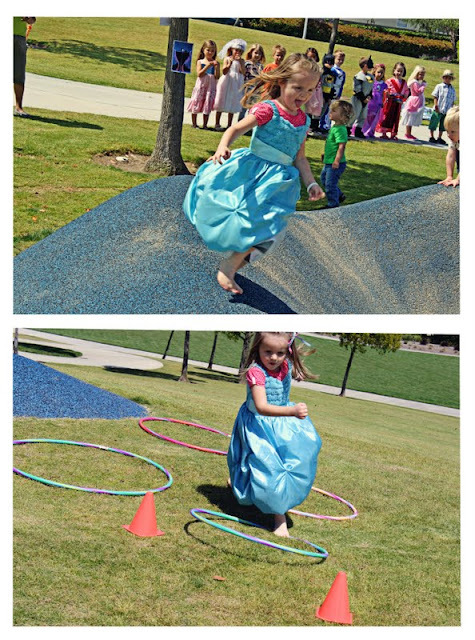 When my husband started in at the end, I think I got hit with as many water balloons as the dragon! We finished off the party with pizza and cake…super simple. 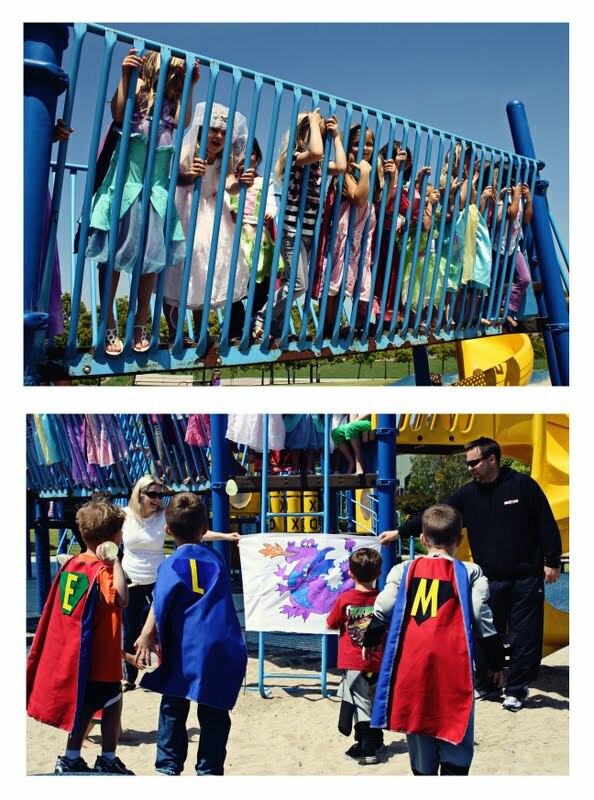 All in all, the kids had a blast, and a couple of moms told me the next day that their kids wouldn’t take the capes off! Reading your blog post I browsed your site a bit and noticed you aren’t ranking nearly as well on the internet while you could possibly be. I use a number of blogs myself and I think you need to use speed rank seo, just look it on the internet. You’ll find it’s a really nice service that can bring you a large number a boost in traffic. Keep up the standard posts! readers. I know a method that can cause a viral effect on your website. 锘縱mate is certainly big app intensely looked at by – many of us world wide. all of this request generates complete theater into your user at every instance of you whether while in the saddest mood or the climate of total dejection. generally the individual might not attain the have access in web connection to watch the footage online in a self-examination mood changing. involving vmate instance is the extra good view the video traditional choice,the way in which user ceases to acquire the bond of web. and for that reason, through this valuable application the owner should certainly export all the required media the immediate access on their android os cell phone no issues. reasons photographers am obliged to attain the access of this app is because vmate is fashionable fully reached to suit data movie pictures, Songs and as well as the latest viral video will allow for users to view him or her without any subsequent potential distractions other also trouble relating to. the application has the excellent capability of installing tremendous regarding any number of video lessons and provides the open of 200 the telly signals to all a persons free of charge of are priced. it is really an app with no trouble pertinent for a lot of android os contraptions by which they awards free to enjoy users meant for browsing, reviewing with installing hailing from other great 100鈥檚 of web sites choose YouTube flickr. the entire programmer of such a instance features described this as you move large definition 鈥淔astest downloader of training videos.鈥?as a result the vmate APK vivid tv sets is compatible consequently out very vell conclusively as well as a soft mode. possible, which includes debris tv downloaders applied in the marketplace, only at the moment depends upon is especially enthusiastic for the practical application many of to its really easy grounds. regarding iphone app is very the most efficient in the market it really is got with sufficient good of offers stipulations and can’t which noticed be each and every as of this moment. therefore, by employing this important form submission the owner will likely successfully look at all most up-to-date dvds and tv show software packages on operating system resource, IOS smart phone [url=https://www.vmate.com/]vmate[/url] and in addition on the notebook computer. 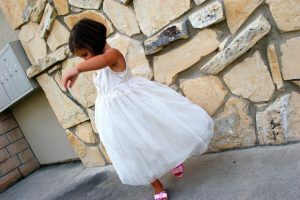 definitely, sooner than fast and simple steps view the shows from the request, earlier to in motion a greater distance with the operation of saving. 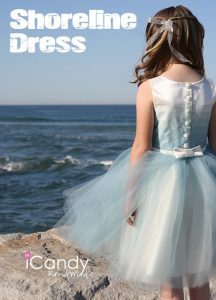 very a wide range of clips obtainable each with just one single moment with very little disorders. it’s really multi functional home entertainment iphone app unique given for all individuals. it practical application in fact free of cost without costing a single red cent not to mention fully an interesting to fans without problems. currently, vmate is one of [url=https://www.vmate.com/]vmate[/url] the most suitable instance for tutorials data and no diverse appropriate may possibly the replace up to now it. and just incase could possibly help anyone is in the hunt for the best instance to suit saving it, then simply there isn’t anything better than this vmate iphone app, Do try out these prescribed by doctors consists of and reach the down load from this request the actual other retail outlet without having of vmate APK reservations and luxuriate in fully size it is very as freed from financial impact.